On the basis of the dioptric principles outlined in the Introduction, visually dependent nocturnal animals are predicted to have large pupils relative to focal length, and visually dependent diurnal animals are predicted to have small pupil diameters for their focal lengths. These dimensions cannot be measured accurately in preserved eyes and are known for only a small number of vertebrates (e.g., Arrese, 2002; Hughes, 1977; Martin, 1999). Here, we use the axial diameter of the eye as a surrogate for focal length, and cornea diameter as a surrogate for pupil diameter (Figure 4). Hughes (1977, Figure 9B) has shown that, across a range of vertebrates of differing activity patterns, focal length is approximately 0.6 axial diameter of the eye. Assuming that this relationship is constant across vertebrates, we use axial diameter of the eye as a surrogate for focal length. Cornea diameter is a reasonable surrogate for pupil diameter as there is no obvious reason to have a cornea that is significantly larger than the pupil. To investigate scaling relationships of cornea diameter and axial length, head and body length is used as a measure of body size for comparisons across different groups of amniotes. The relationship between relative size of the orbital aperture and activity pattern has long been of interest to paleoprimatologists because it provides a method for reconstructing activity pattern in moderately well-preserved fossils (Beard et al., 1991; Heesy and Ross, 2001; Kay and Cartmill, 1977; Kay and Kirk, 2000; Martin, 1990; Rasmussen and Simons, 1992; Walker, 1967). Given the relationship between eye shape and activity pattern predicted above, we also predict that there will be a relationship between orbit shape and activity pattern. Specifically, we predict that the size of the orbital aperture relative to the axial depth of the orbit should be correlated with activity pattern. The underlying assumptions, that pupil or cornea area is correlated with orbital aperture area, and that the axial length of the eye is correlated with the axial depth of the orbit, have not yet been evaluated using measures of orbit and eye shape taken from the same individuals. Orbital aperture size is estimated by the diameter of the orbital aperture, measured from orbitale inferius to the orbitale superius (Cartmill, 1970). Orbit depth is calculated as the distance from the midpoint of orbitale superius-orbitale inferius chord to the superiormost point along the rim of the optic canal. These measures were extracted using customized macros in Microsoft Excel, from 3D coordinates of points collected using a Microscribe 3DX digitizer (Immersion Corp., San Jose, CA). Orbit diameter data for Cantius abditus are from Heesy and Ross (2001). The optic canal of Cantius abditus (USNM 494881: Rose et al., 1999) is not preserved. A minimum estimate of the axial depth of the orbit in C. abditus was obtained by combining the length of the orbit floor in C. abditus (USNM 494881) with that of another specimen of this taxon (USNM 93938). 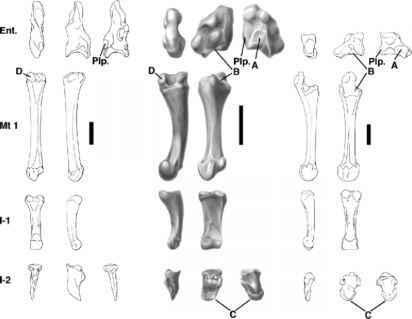 Comparisons of C. abditus (USNM 494881) orbit and preserved braincase with similar-sized extant strepsirrhines (e.g., Otolemur crassicaudatus) suggest that the orbit depth was not substantially longer than this estimate. The majority of the eye shape data were derived from Ritland (1982). Data from nonadult individuals were excluded. The primate eye shape data were derived in part from Ritland (1982), as well as from unpublished observations made by C. F. Ross. Additional data on bats and birds were collected by M. I. Hall (Hall, 2005). The orbit shape data were collected from different specimens than the eye shape data. Reduced major axis (RMA) regression equations for all Aves, Primates, and Mammalia were calculated from least squares equations generated by SPSS 12.0 for Windows. The RMA slopes, intercepts, and correlation coefficients are given in Table 1. How to measure orbit size in mammals?